I have had several years of enjoyment from the Realtime Preamplifier that I built as a close copy of Vacuum State's production RTP3C. This design is a well-thought-out implementation of what might be an ultimate conception of how a preamplifier should work. The RTP3 has a clever differential circuit, using a total of twelve 6922 triodes to handle the signal, together with a precision dual bipolar transistor as the lower half of the phono input cascode to usefully increase the gain for low-input moving-coil cartridges with minimal noise penalty. It has a dual-mono topology, with channel separation extended ergonomically as far as dual volume and source select controls, the latter incorporating a clever approach to selection of signal polarity, allowing the user to choose either polarity of each signal source. The RTP3 has had uniformly excellent reviews online, and the consensus is that it does just about everything very well, especially dynamics, neutrality and soundstaging. I also agree with the remarks these reviewers make about the RTP3 being exceptionally clean and relaxing to listen to, which I feel is the result of the very low distortion in this circuit, achieved without the use of any loop negative feedback (which tends to reduce lower-order harmonic distortion but creates high-order distortion that is more subjectively objectionable). So, when I have what must be one of the best preamps in the world, why did I want to build one that might not sound as good? 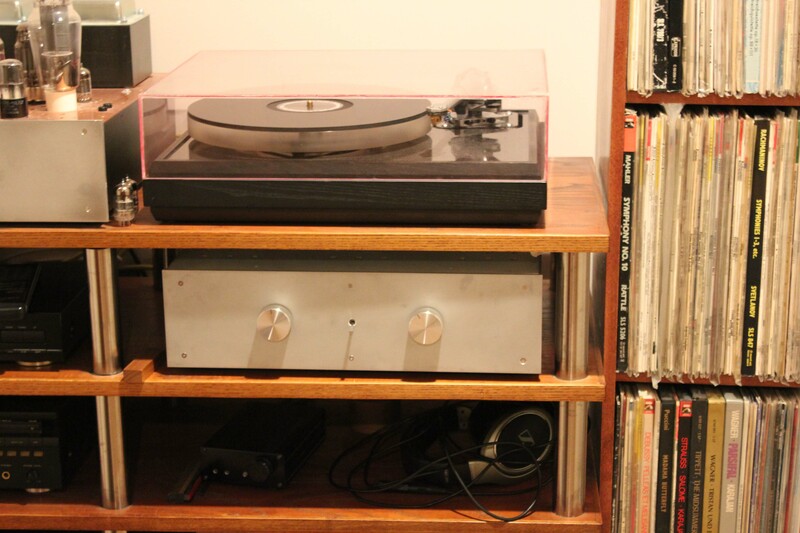 The main reason was that I decided recently that I really ought to have a spare preamplifier. There have been several instances where I have had to take the RTP3 out of my system; these were mainly to install upgrades such as the ELMA-based switched attenuator volume controls and source selection with full control over signal polarity (as in the commercial unit) as well as some work I carried out to the power supply. On top of this, though, I have had a couple of very frustrating episodes where faults developed in the solid-state regulator boards: the first when the signal from phono input faded out on one channel after the preamp had been on for an hour or so (which I eventually traced to a sagging HT voltage from the shunt regulator), and the most recent from a moment of imbecility when I disconnected the HT cable from one channel while the PSU was still switched on; this sent a high-voltage pulse that killed all the semiconductors in the regulator for that channel. On each of these occasions, I was unable to listen to music through my system for a week or more, and while iTunes on a MacBook Air is bearable (at least though headphones) for a while, I really missed being able to play my records. The solid-state preamp I built a few years ago was something I was proud to have designed and completed myself, and made a good match with my DIY ADEQ phono stage, but now that my ears have got used to the ease and natural dynamics of the RTP3 these complex circuits stuffed with op-amps sound grey and quite fatiguing. There is no particular reason to expect any more problems with the RTP3 in the near future, but it would certainly be good to have an acceptable spare, just in case. A couple of years ago I completed a differential active crossover of my own design, based around the circuit concepts of the RTP3, but retired it after a few months - mainly because of an intermittent signal dropout in one channel, but also because its fourteen valves and shunt regulator pumped a seriously extravagant amount of heat into the living room in addition to what came from my RTP3 and 300B monobloc power amps. 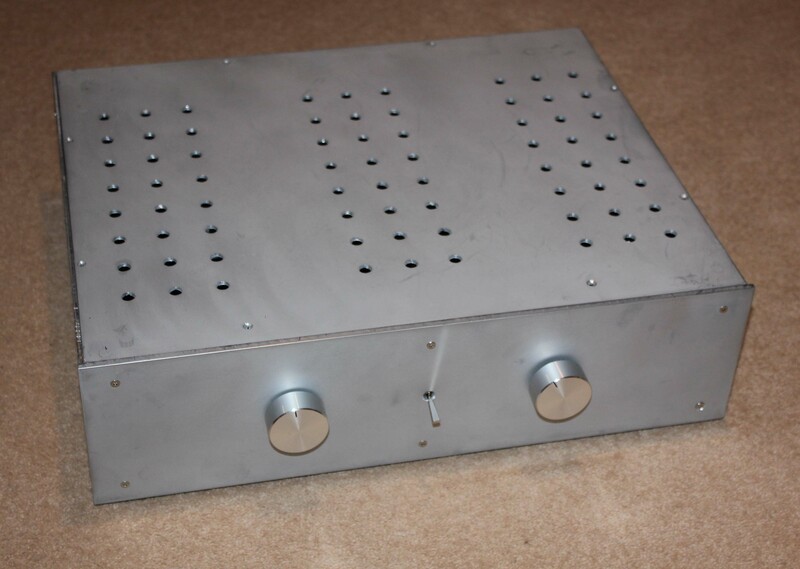 I subsequently replaced this with a passive crossover for my DIY speakers, and found the result musically satisfying, so as a result I had a spacious enclosure and a large box of parts - including a good set of 6922 valves - going spare. I did briefly consider building a second RTP3, but in the end decided that that wouldn't be a productive use of my time. The Vacuum State Six-valve preamplifier (SVP) , also designed by the sadly missed Allen Wright in partnership with Joe Rasmussen, is a simpler conception than the RTP3, doing away with the differential architecture but keeping Allen's philosophy of zero feedback circuits and his "super linear cathode follower" (SLCF) output stage. Its valve count is halved to an altogether more practical six, meaning less expense in both electricity bills and valve replacement (both of these are significant if the preamp is left on constantly, as Allen always recommended). This has itself also gained fulsomely positive reviews, including one in Hi-Fi Plus magazine (see links below), and is reckoned to be only a small step below the RTP3 in absolute sound quality. I worked out that I could put together an SVP from the parts in my defunct active crossover with minimal extra outlay, and curiosity got the better of me. This would provide a spare preamp for my system for those times (hopefully rare) in the future when the RTP3 is perforce off the shelf, and I was open to the possibility that, if the sound quality of the SVP turned out to be at least acceptable, it might - at least temporarily - replace it for reasons of practicality, lower power consumption and simpler ergonomics. The phono stage in the RTP3 is a strikingly innovative design: for a start, it is totally differential, with the cartridge connected across the two inputs. My previous ADEQ phono stage also had a differential input via a SSM2016 monolithic IC, but where the latter (like many other comparable circuits) needed three stages to do the amplification and equalisation, the RTP3 heroically did this all in one, using the cascoded pair of matched bipolar transistors and high-transconductance 6922 valves to generate a gain of 50dB at 1kHz, and the RIAA equalisation is also done differentially in one step, with an RC network strung between the two anodes. By contrast, the phono stage in the SVP is not an especially original circuit - in fact, it is rather similar to the front end of the Arthur Loesch preamp, and even closer to the phono stage of Mark II of Thorsten Loesch's version of his (unrelated) namesake's highly regarded design, with its cascoded JFET input stage. It has two simple common cathode amplification stages, with the passive two-stage RIAA equalisation split by the second. As usual with Allen's designs, there is no loop negative feedback, though the unbypassed cathode resistors provide some degeneration to control the AC gain of the stages. The valves have standing currents of 3 and 6mA, which is quite a bit higher than used in most 12AX7/ECC83-based circuits: Allen liked to use his valves at relatively low anode-cathode voltages, but at higher currents, which he believed led to good performance, but longer valve life. The line stage is more interesting: an unremarkable common cathode gain stage is followed by one of Allen's signature Super Linear Cathode Follower (SLCF) unity-gain buffers, with a triode under the cathode to ensure a constant current through the cathode follower and another atop the anode to keep the voltage across the middle triode constant. This should ensure a very low distortion even into low impedance loads, without recourse to loop feedback. The voltage gain stage again has a healthy 6mA running through it, while there is 10-12mA standing current through the output stage, which will give it a high slew rate and plenty of driving capacity. The 1uF capacitor on the main output gives a low-frequency rolloff with -3dB point of about 3.3Hz into a typical power amplifier input of 47K. The all-valve SLCF is the main change between the final incarnation of the Four-Valve Preamplifier (the FVP5), which used MOSFETS as current sink and bootstrap devices, and the SVP: Allen in his latter years recanted and felt strongly that MOSFETs were altogether unsuited for this role. Confusingly, he also referred to the SVP as the FVP5A, despite the change in valve count. As far as the commerical Vacuum State products went, the SVP1 and SVP2 were essentially the same preamplifier, with the later model having the number of inputs increased from five to six as well as various upgrades to the power supply. One thing which is likely to affect the long-term performance of the SVP relative to its differential big brother, especially that of the phono stage, is the use of common cathode amplification stages in the second stage of the phono circuit and as the voltage amplifier in the line stage, instead of the differential cascodes in the RTP3. The cascodes and current sinks in the RTP3 linearise the amplifying stages and give major improvements to bandwidth, but just as importantly make the operation of the circuit almost completely independent of the parameters of the actual valve: the upper valve behaves like a current source with a very high effective resistance, so the output impedance is essentially the anode load (25K in both preamps). I would expect gradual changes in the transconductance of the valves as they age to have at least a small effect on the gain of both stages of the SVP, and - possibly more crucially - on the high-frequency response of the RIAA equalisation. Since the gain of the preamp is at least partly determined by the valve parameters, these will also need to be more carefully matched than in the RTP3, as will the JFETS in the phono stage (as Allen indeed recommends on the schematic). The RTP3's differential architecture brings other advantages as well: (a) almost complete immunity from noise on the HT lines (this is a common-mode signal, which is rejected by the differential circuit); (b) doubled overload margins; (c) cancellation of even-order harmonic distortion; and (d) higher signal-to-noise ratio (the upper end is expanded by 6dB, while the noise will only increase by 3dB). The common cathode circuitry, in particular the cascode input stages, along with the single-ended circuitry of the SVP, will make it potentially sensitive to power supply noise (even if this is largely cancelled out in the RTP3), and Allen always strongly recommended feeding the HT from a shunt regulator (more specifically, his own SuperReg). Allen has published measurements that show that the FVP/SVP has very low distortion, even without recourse to negative feedback: the second harmonic is down at -65dB, with the other harmonics lost in the noise at -80dB and below. The SVP and RTP3, with solid-state input devices in their phono stages and relatively modest values of the anode resistors, should both have low intrinsic noise levels when playing vinyl, provided they are fed by a clean HT supply and the wiring done correctly. So, in summary, the SVP is a simple and fairly classical valve circuit, with the exceptions of the JFET in the phono input and the SLCF output stage. I suspect that the acclaimed sound quality of the FVP5/SVP is mainly due to the combination of the SLCF, with its excellent current driving capacity and low distortion, the choice of operating points for the active devices, and the quality of the active regulation. I find it interesting, given that the two preamps have very different modes of operation, that reviewers describe the two preamps as having a very similar "sonic signature" - I can only think that the aforementioned approaches override the effects of the differential architecture and generous scattering of current sinks in the RTP3. Actually it's possible that in one respect the SVP might sound better than its differential cousin, since the distortion spectrum of the single-ended circuit is a classic monotonically decreasing series of harmonics (basically only the second and third harmonics), which is often associated with a more pleasing sound. 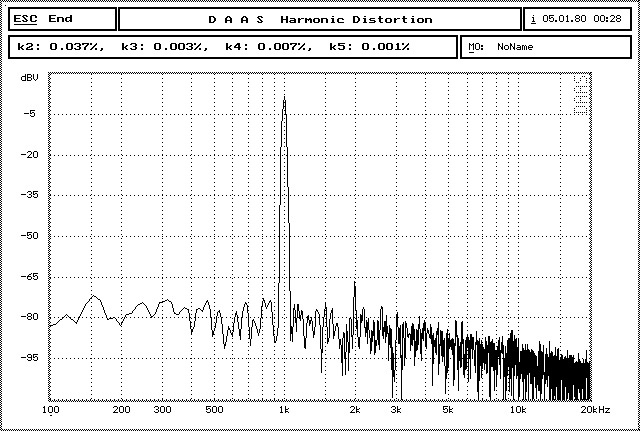 The differential RTP3, by contrast, only has odd distortion harmonics (admittedly at very low levels), which are often associated with a "hardness" in the sound. Lynn Olsen has written a fascinating article on the subjective effects of harmonic spectra from valve circuits. When I built my RTP3 I tried to get the layout as close as possible to that in the photos of commercial Vacuum State products - partly to save time in planning, and partly to get any parasitic capacitances and inductances close to those in the original. The commercial SVP1 and SVP2 products from Vacuum State are both built on PCBs, with the mains transformers sharing a single box with the signal circuitry. In this case, however, I decided early on that I wouldn't make any serious attempt to reproduce the layout of the VSE SVP, because I already had a full-width box built for an RTP3-style hard-wired arrangement as well as the original outboard PSU box. I used essentially the same construction as for my RTP3, so I won't describe this in any detail here. What is different is that the SVP doesn't have the symmetry of the RTP3 between left and right channels: I clustered the two regulator boards together as before, but to one side of the box to keep them close to the power connectors, and the phono and line stages for each channel likewise share a track in the box. There is of course still one shunt regulator for each channel. The source select switch and volume control pot are mounted amidships in the box and linked to the front panel knob via 6mm aluminimum shafts: this reduces the distance between the potentiometer and switch and the relevant circuitry. For the moment I am using fairly standard parts (as I still am in my RTP3): the resistors are 1% metal films from Maplin, while the capacitors are mainly metallised polypropylene, with Mundorf or SCR KP-SN tinfoil and polypropylene film for the 1uF and 0.22uF coupling caps (the bootstrap capacitors in the upper part of the SLCF output stage also have to be considered as coupling caps, of course). The two 25uF electrolytics for the grid bias in each channel - surprising to see these in the circuit, given Allen's professed dislike of this part type! - are bypassed with standard 0.22uF metallised polypropylenes. The single-ended circuit of the SVP means that the film caps in the RIAA EQ circuits need a much higher voltage rating than the equivalent parts in the differential RTP3, despite the lower HT voltage: the 15nF in the first stage sees 175V, and the 3n3 in the second needs to be rated to at least 100V. I didn't have any polystyrene caps with a high enough voltage rating, so for the time being I used closely matched pairs of WIMA FKP1 polypropylene metallised foll caps in these positions, with an eye to upgrading later on. The 2SK170bl JFETS in the phono input are from a batch I matched quite closely into pairs a few years ago for another project. There are four pairs of line-level inputs, plus MC level phono. I also added a record output (see below) and two sets of line outputs. I originally implemented the line outputs with two pairs of RCA sockets, but after a little while replaced one of these pairs with male XLR connectors with their cold pins shorted to ground, so I could use the same XLR-terminated interconnect I use with the RTP3. The source select switch is the same two-pole six-way budget component from Maplin that Allen denigrated in my RTP3, but I will keep it until I am happy with the rest of the preamp. As with the RTP3, I started off using a Sfernice P9 50K dual ganged potentiometer for the volume control, simply because I still had the original ones I took out of the RTP3 when I put in the ELMA stepped attenuators. After a while, I started to feel frustrated with the limited control at low volume settings, and replaced the pot with a series attenuator based on an ELMA 04-2133 2-gang, 24-way rotary switch and Maplin 0.6W metal film resistors. Finally, I added a mute switch to the front panel, which works axactly the same as the one in my RTP3, with relays shorting the line outputs of the preamp. I decided (as with the RTP3) to leave out the blue LED on the front panel of the VSE preamplifier that indicates mains power: the gentle hum given off by the power supply box is enough of an indicator for me, and I can't say I find LEDs particularly relaxing (least of all blue ones) in the listening room. The SVP schematic supplied by Vacuum State doesn't have any indications for the power supply, apart from the required voltages at various points of the premplifier circuit, so I had to design and build mine from scratch. For frugality, I recycled my original, smaller PSU box from my RTP3. 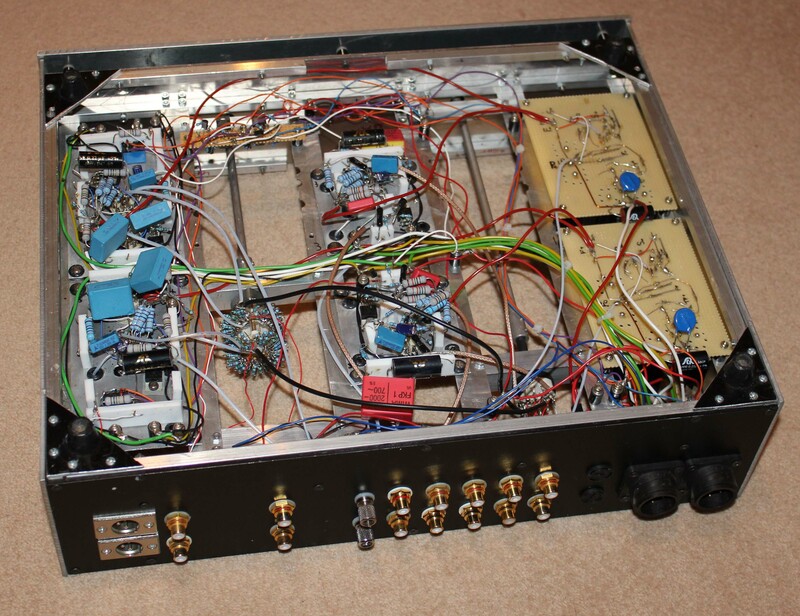 which was eventually replaced in that project by a full-with box I built to match the RTP3 preamp box. I smartened up the greay-painted steel Maplin enclosure by spraying it black and adding a nice 5mm aluminimum front panel. As it turned out, the HT transformer was slightly too tall for me to be able to put the cover back on the box, but when the PSU is sitting on the bottom shelf of my system rack it is relatively safe from prying fingers. Because of shortage of space in the PSU box, I used a single mains transformer and choke for both HT supplies, but provided separate filament transformers for each channel. The HT supply is choke regulated (as preferred by Allen), with a 10mH choke (DC resistance of about 75 ohms) before the 47uF reservoir capacitor. To start with, I used a cheap 450V electrolytic for the latter, but soon replaced it with a chunky SCR 630V polypropylene of the same value, which just squeezed into the space between the transformer and choke. I tuned the unregulated HT voltage to about 300VDC with a film cap between the rectifier bridge and the choke. I used two 50VA transformers to give two separate filament supplies per channel, as recommended by Allen in the schematic above. I decided to use Nikos Salas' SSHV shunt regulator in the SVP, rather than Emile Sprenger's HPHV regulator, which I found to be unreliable in my RTP3 in the longer term. This is not meant to be any kind of adverse reflection on the HPHV design, which I regard as very sophisticated, and the failures I encountered may well be related to PCB issues or to repeated overvoltage spikes at the input of the regulator. I built the SSHV regulators on matrix board, identically to the ones in the RTP3, and with essentially the same layout as the PCB issued as a group buy on the Audio DIY forum. The total current drawn by each channel of the SVP is around 30mA, and I set the current in the regulators to 40mA to give a safe margin. I did a quick and dirty measurement of the ripple at the outputs of each of the regulators (with a DVM via a CR network to block DC), and found this to be below 200uV in both channels. To start with, I used a 2SK170bl JFET in the SSHV, since I didn't have any of the recommended lower-Vdss 2SK170gr/2SK170gr devices. If I had read Nikos Salas's comments in that forbiddingly long DIY Audio forum thread, I would have expected that, in his words, "Avoidi, it will drift more". Indeed, I found problems with long-term drift in the regulated HT voltage until I managed to source a batch of 117gr on eBay. The functioning of the voltage amplifier at the input of the line stage is not especially sensitive to the DC voltages on it - the anode needs to sit somewhere not far off halfway between the HT voltage and ground, to allow a symmetrical voltage swing and reduce distortion. The following SLCF output stage is DC-coupled to its anode, however, and its operation depends more critically on its quiescent DC voltages: the upper two valves split the voltage between the cathode follower output and the HT line, so this needs to be large enough to give each valve adequate working room, which for the 6922 needs to be at least 50V or so. This explains Allen's recommendation for 100V at the anode of the gain stage, which with a 250V HT voltage will give somewhere between 75 and 80V across each half of the upper 6922. It seems that there is some concern in the DIY community as to the ability of the common cathode input circuit of the FVP5A's line stage to function as intended. Specifically, a typical 6922 appears to have too high a transconductance to reach the required quiescent current with the specified anode and cathode resistor values. A quick calculation shows that, with the target of 100V at the anode, the standing current is 6mA, but this would drop 13V across the 2K2 cathode resistor. A glance at a 6922 data sheet reveals that at this large bias voltage the valve would be effectively cut off, passing no current. In reality, the valve will settle at some current value below 6mA. Indeed, I found that in my SVP, with the initial complement of 6922s, the common cathode stage had a standing current of 2.5 mA in one channel and 2.65 mA in the other. This gives a headroom of about 65V across the anode resistors, which will seriously starve the output stage of voltage. Allen suggests the builder tweak the cathode resistor to get a standing current of 6mA , but some have found that they needed a large reduction down to 500 ohms or so (from the specified 2K2), which gives too high a voltage gain. Others have suggested increasing the anode load resistor from 25K to 33K, but this has a similar effect on the gain. Allen has also proposed selecting 6922 valves to give the best operating conditions in circuit, but in my view this is not practical for most builders, since such a valve would be well outside the normal parameter range for this type. On the FVP5A schematic (see above), Allen cryptically suggests the 5687, among other alternatives to the 6922, in this position. 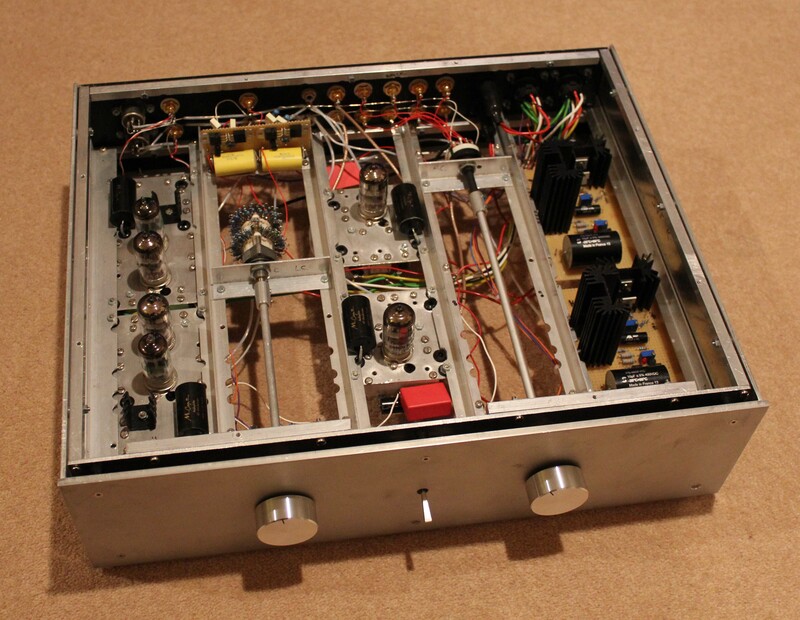 John Brosky talks enthusiastically about using the 5687 as an upgrade to the 6922 in his "Aikido" preamplifier circuit. Comparing the data sheets for the two valves did make me wonder whether the 5687 might indeed be a lot better suited for this position in the circuit: it has a lower transconductance (8.5mA/V, compared with 12.5mA/V), a lower anode resistance and a higher pinch-off voltage, which should help a lot in getting a higher standing current. I bought a couple of NOS GEC 5687s from Langrex, and rewired the respective socket for each channel accordingly. Interestingly, the 5687 filament takes 900mA at 6.3V, or three times the current of the 6992 - I was glad at this point that I had seriously over-specified the mains transformers for the heater supplies! I replaced the resistors on the filament current regulators with an appropriately reduced value (1.4 ohms, or four 5R6 in parallel) to get 6.3V across the paralleled filaments. The LM317T regulators themselves are specified for 1.5A, and are mounted directly onto the aluminium chassis plates, but this part of the chassis did get very warm after a few minutes so I fixed a small heatsink to the upper side of the plate just to be sure. With the 5687s installed, I found that a value of 820 ohms for the cathode resistors gave 101V and 103V at the anodes of each channel, which is much more satisfactory than the 400-500 ohms or so mentioned on the forum thread above (and also confirms that the pair of 5687 valves are well matched). I should note that the GEC 5687s are the most microphonic valves that I have come across (at least in this position in the circuit): if I tap either of them lightly with a pencil I get a loud "ping" through the speakers. I have no icea how much this might affect sound quality, but I might think about trying the effect of a couple of "tube damper" type devices on them. The FVP5a schematic on the Vacuum State site only shows the phono and line stages, slong with the input selector and volume controls. I was able to put together a working power supply circuit myself with not much thought at all (particularly since the required supply is very close to that of the RTP3), but there is nothing online that I can find about the configuration of the record output buffer in the production SVP2. This needs to extract the signal between the source select and the volume control, and present this to a unity-gain buffer with a high input impedance. In my RTP3 I started off with a pair of OPA604 op-amps to do the job, though Allen mentioned that he used some kind of JFET buffer. I settled on a simple JFET source follower using a 2N5459: this has a constant-current source load based on a J310, set to pass 5-6 mA, for increased linearity. It is fed by +-12V dual rails, regulated by LM317/337 chip regulators. For peace of mind, I also added a feature not in the commercial VSE preamps: a sensor that shorts the output via the mute relay until the circuit has reached a stable operating state. When I was using the HPHV shunt regulators for the HT supplies, the slow ramp-up of the regulated voltage meant that I could use this to define the target state: in fact, I built a circuit for the active crossover that used an LM311 comparator to sense when the HT line was within 5V or so of its desired level. With the SSHV2 regulator, though, the HT settles on its target voltage rather earlier than the valve filaments reach their operating temperature, so this won't really work. Instead, I used a similar circuit to the above to detect the current in the cathode resistor of the output stage, which by definition should be pretty constant once the valves are warmed up. Once I had sorted out the biasing of the 5687s, I did a quick check on the voltages in the rest of the preamplifier after it had been fired up for about an hour. The input stage of the phono EQ circuit has a standing current of 3.19mA (both L and R), and the second stage 6.33mA (L) and 6.07mA (R). The voltage amplifier stage quiescent current is 5.89mA (L) and 5.78mA (R), while the SLCF output stage passes 10.4mA (L) and 10.5mA (R). The line stage gains are 19.2dB and 19.8dB, which is perhaps higher than I would prefer (and about 10dB more than my RTP3), though close to the specified figure of 18 dB in the SVP2 leaflet from VSE. Overall I feel the the two channels are matched, in both DC and AC senses, to a very acceptable level. For the first few days, the SVP sounded disappointingly a little dull and stodgy, with the bass (especially from black disc) quite thick and indistinct, but clarity improved markedly by the end of the first week of listening. I remember the same process happening when each of the three Croft preamps I have owned were new: I still don't really understand the "burn-in" process, but it is certainly audible to me. One of my favourite jazz albums is pianist Ibrahim Abdullah's Water from an Ancient Well, which has a real South African flavour in its melodies and harmonies, despite the conventional jazz instrumentation. This 1985 digital recording has very clear bass and distinctly separated performers, even if it lacks the atmosphere and expansive soundstage of classic analogue recordings, and my Vectored Pink Triangle deck and the SVP brought this across well. This is real "feelgood" music, and the obvious joy of the musicians in playing together in the recording studio came over beautifully. On CD, the 1974 chamber version of Bach's Art of Fugue and The Musical Offering by the Academy of St Martin in the Fields was very enjoyable: the magnificent 8-part Ricercar, played by a small orchestra, that closes the latter piece had a lovely bloom that is all too often missing through the CD medium. I now have four recordings of the Art of Fugue: two on piano (by Nikolayeva and Aimard) and two chamber recordings (the above-mentioned ASMF, and a double LP by the Leipzig Bach Collegium), and I keep coming back to all of these again and again for sheer pleasure. The SVP appears very transparent: it is very revealing of the distinct instrumental colour of each of the voices in the chamber recordings, even with the Marriner CD, but at the same time the Leipzig vinyl set still has the edge in this respect, and is just the more relaxing to listen to. I am still in the early stages of listening to the new preamp, so will add more observations as time goes on. The obvious question is: how much better than the SVP is the RTP3? The answer is, perhaps surprisingly, not obvious. It's funny how factors other than the actual sound can affect the enjoyment of our precious DIY handiwork. Listening to the SVP was strangely more relaxing than listening to the RTP3, for reasons mostly unrelated to the performance of either unit. If I had bought the two preamps, instead of building them both from the ground up, the situation might well have been reversed. Having spent months building the RTP3 and dealing with the various issues that arose, including a couple of failures of a shunt regulator (one catastrophic) and an intermittent dropout of the phono stage in one channel, I have a definite subconscious awareness of the complexity of the circuits under the lids of the two boxes. On top of that, the heat radiated from the twelve 6922 valves and the shunt regulators makes its presence felt, as does the slightly intimidating hum from the massed transformers in the impractically heavy power supply box. I couldn't help feeling subliminally, with all those valves and semiconductors carrying what are really extravagantly high standing currents for a mere preamplifer, that the RTP3 was a multiple component failure waiting to happen (though I haven't heard of any reliability issues in the commercial version). Finally, on a recent occasion when the RTP3 was connected up to my system I got some intermittent noises from the left hand channel line stage, which were symptoms of incipient valve failure, and which on this occasion were fixed by replacing a couple of the valves. The prospect of trying to work out which of the six valves per channel is on its way out next time around is not a very relaxing one! In general I had difficulty hearing the effect of polarity reversal in the RTP3, and I find I can quite comfortably do without the freedom to set channel balance arbitrarily (I found the Croft preamps frustrating for the same reason). As far as using the two preamps goes, then, it is almost a relief to have only two control knobs and a mute switch in the SVP, and not to have to worry whether I have the right choice of signal polarity, or to have to check each time I change the volume that the setting is the same in both channels. Anyway, coming back to listening, direct comparison is rendered impractical by the fact that the two preamps each consist of two boxes (linked by substantial umbilical power connectors) and both units need a warmup of at least half an hour before any serious listening. When I compared the RTP3 and the Audio Research SP-11 that came through my hands a few years ago I did actually have both preamps installed and powered up, swapping connectors between them every few minutes, but after that I vowed never to go through this rigmarole again. On top of this, my current feeling is that the sound of my system is dominated by the speakers and the room, and differences between electronics are normally comparatively quite small. So here I will only summarise my overall impressions from several listening sessions, without comparing recordings sequentially between the preamps. I do get a general feeling that the character of the SVP is very similar to that of my RTP3, but I feel that the simpler design is slightly more "forward" and less "composed" than the RTP3. The SVP is if anything perhaps a little warmer and more listenable, and perhaps more beefy in its dynamics. That's not to imply that it must be more accurate than its big brother - Allen was always quite dismissive of perceived "musicality" when it was due to higher distortion. Listening to the SVP after getting used to the RTP3, I can start to understand what Brad Morrical meant in his preamp review in Positive Feedback a few years ago. The SVP does seem to have some of the warmth that Brad noted, and restores the "bloom" of live music-making that the more sophisticated preamp is on the edge of missing out. I suppose this is one of those cases of "heart" versus "head". I have the ultimate respect for the design of the RTP3: I know it has higher headroom, better noise rejection and lower distortion, and its phono stage is fiendishly elegant and simple. At the same time, right now I am in no hurry to change back to it, and am happy to continue exploring my record collection through it. On top of that, in the sweltering early summer of 2014 it was definitely a pleasure to have only six valves warming up before each listening session! The Electro Harmonix 6922 valves, inherited from the old active crossover project, came from Banzai Musical Effects in Germany. I bought the NOS GE 5687 valves from Langrex in Sussex: faultless service and next-day delivery. The film caps were from Tout le Haut Parleur in France. They have a very extensive range of film caps at almost any value you might want. The ELMA rotary switch for the volume control came from the HiFi Collective. Again, excellent and speedy service. Review of the FVP5 on the TNT-Audio site. Note that some of the photos in this review are of an RTP3, and not the FVP under review. The FVP5a in a group preamp review on Positive Feedback. Jack Roberts reviewing the SVP-1 on DaGogo. Warren Gregoire's impressions of the SVP-1. Vacuum State Electronics, Allen Wright's company. Lynn Olson's excellent articles on his Nutshell Hifi site. Joe Rasmussen's article on developing the FVP5. This is quite an old article, but has some nice photos of the FVP at the time. 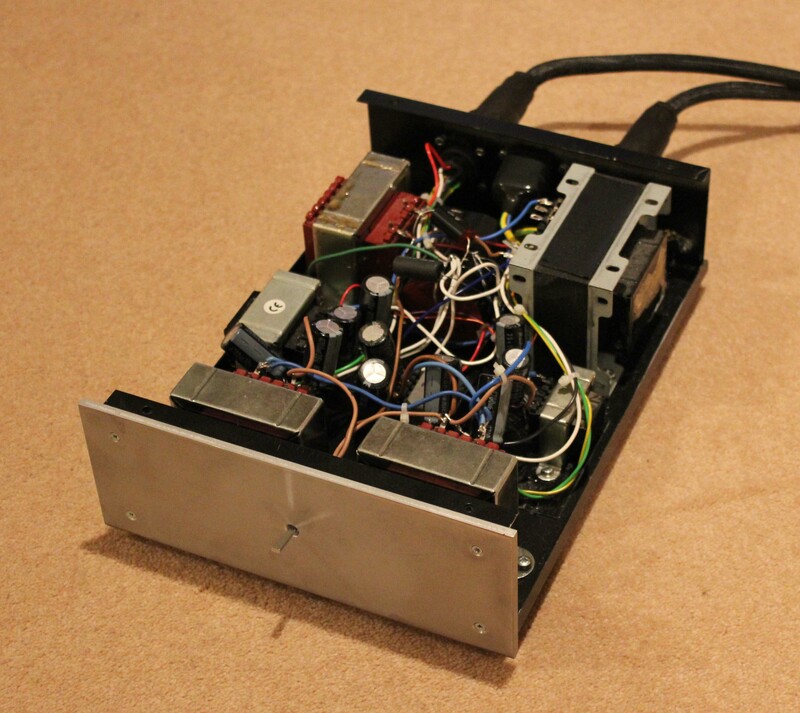 An FVP5 builder's report on the DIY Audio forum. A discussion on the Tube DIY Asylum on building the FVP5A/SVP. The thread on the DIY Audio tube forum on the SSHV2 regulator: I asked a question about whether the noise levels on my SVP might be related to the regulator, and got some very helpful replies: this starts on page 444! I am enormously grateful to the late Allen Wright and to Joe Rasmussen for their original inspiration and circuits, as well as for Allen's generous and helpful advice when I was building my RTP3. I also appreciate the useful suggestions made by members of the DIY Audio forum in reducing the noise levels in my SVP.